On this adventure we're taking a nice spring hike to King Creek Falls, a beautiful cascade located just on the other side of the Chattooga River near Burrells Ford. 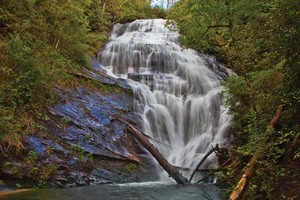 King Creek Falls is a big and energetic waterfall, tumbling about 80 feet to a nice clear pool at the base. There are a couple of ways to access this waterfall but my pick is from the trailhead beginning at the intersection of Burrells Ford Road and the entrance to the Burrells Ford Campground, this is part of the Foothills Trail (the Foothills Trail is marked by white blazes). This is the best way to go since there are numerous and sometimes confusing trails all along the Chattooga's riverside. Also remember that wildflower season is approaching so it would be a good idea to bring along a book to help you identify the lovely flora along this trail. 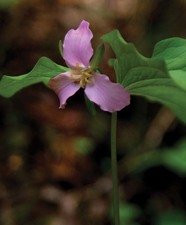 Along this trail you san see Cinquefoil, Bluets, Birdsfoot Violets, Wild Mountain Iris and Trillium. And let's not forget the Dogwoods and Mountain Laurel later in the season. Those are flowers I've spotted before anyway. After crossing the bridge, the trail ascends following the creek upstream before the Foothills Trail bears off to the right and the waterfall trail continues upward, mostly straight along. (Pay attention here as there is a nice wooden sign here indicating the direction to the falls.) Now the trail gets a bit steeper, sometimes rocky and often slippery. After crossing over a notched log, the falls can soon be seen off in the distance. A minute or two more and there you are, the stunning King Creek Falls. Since this waterfall is adjacent to a campground, I imagine it's quite popular on weekends, so keep that in mind if you're looking for a solitary experience. The pool at the bottom looks perfect for wading and there are lots of nice rocks to relax on, catch some rays and have a snack. Happy hiking! With flower scented air that gives us a lift. Let's get out on the trail to see King creek falls. From US 441 in Clayton, go east on Warwoman Road until it dead ends into Hwy 28. (about 13.5 miles) Turn right on Hwy 28, going south, and proceed 2.3 miles looking for Burrells Ford Road on the left. Follow Burrells Ford Road (gravel, forest service) 7.5 miles to the Chattooga River. Cross over the river and continue for 4/10 mile to the Burrells Ford Campground on the right. The trailhead is right behind the information board at the entrance. To see more of Peter's photos or if you have a question or comments visit www.mcintoshmountains.com.